Our practice is committed to providing you with the personalized, gentle care that you deserve. We use conservative, state of the art procedures and materials that will restore your dental health and maintain your beautiful smile for many years to come. Please stop by to meet our friendly team of professionals. We look forward to meeting you and your family! Se habla Espanol. Escribe por correo electronico. Palo Alto Dentists, Dr. Kevin Low and Dr. Whitney Lorenz are dedicated to cosmetic dentistry such as Exams, Teeth Whitening, Veneers and more. 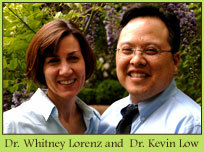 We are looking forward to your visit to our Palo Alto, CA dental office.